Dr Tahir-ul-Qadri, leading thousands of his supporters, entered Islamabad late Monday to mount pressure on the government to introduce ‘electoral reforms’ to stop corrupt elements from taking part in elections. Qadri told his marchers that the sit-in will continue until the government resigns, the demand described as ridiculous by the Information minister. Interior Minister, Rehman Malik, said that the FIA will investigate funding Tahir-ul-Qadri is receiving, adding that Qadri also failed to assembly four million people as he had claimed. Dr Qadri started the march from Lahore on Sunday and after 33-hour journey reached the capital territory, where will speak to the marchers and will present a charter of demands. Spokesman for Qadri’s spokesman, Omar Abbasi said that the marchers will stay in Islamabad for several days and that he will present ‘surprising demands’, without elaborating. A stage was erected on the city’s Blue Area just two kilometers away from the parliament building. 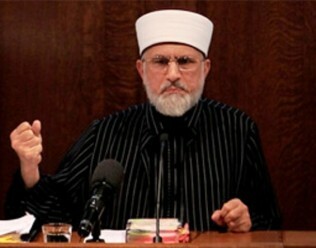 Qadri will speak behind bullet-proof glasses over security concerns. Officials say that over 20,000 police and members of other law enforcement agencies have been deployed in Islamabad to ensure peace during the rally. Interior Minister, Rehman Malik, reviewed security measures on Monday and visited the site of the demonstration. He also took an aerial view of the security arrangements. Malik, again warned of possible attacks on the marchers by the militants. He said Taliban have planned attacks on the long-march and that the security agencies have traced a call from the Taliban leadership, issuing instructions for a hit of the marchers. He also said that another militant group ‘Jundullah’ has entered the area for a possible attack. The marchers however arrived safe to Islamabad. Dr Qadri, who is head of a religious outfit ‘Minaj-ul-Quran’ returned from Canada last month after five years and getting Canadian nationality. Under a recent ruling by the Supreme Court, dual nationality holder cannot run for elections. He had also issued a religious decree against the Pakistani Taliban and their violent approach in London in March 2010. Qadri told the marchers on the way that his struggle for a ‘ revolution’ will continue to purge the country of what he called corrupt elements. The federal government had earlier advised the organizers to hold demonstration in Islamabad’s main park but they had refused and later the marchers were allowed to enter the city’s center. The Islamabad’s administration has closed all routes to the so- called ‘Red Zone’, which houses diplomatic enclave, president and prime minister houses, ministers offices, the parliament house, supreme court building and other sensitive buildings. Many embassies were closed on Monday in view of security concerns. The government had also closed all educational institutions on Monday.